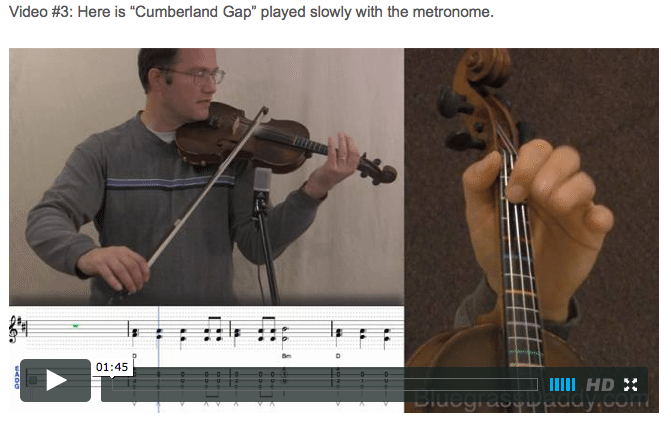 This is an online fiddle lesson for the tune "Cumberland Gap." This lesson is by special request for my friend Alan. The song's title refers to the Cumberland Gap, a mountain pass in the Appalachian Mountains at the juncture of the states of Tennessee, Virginia, and Kentucky. 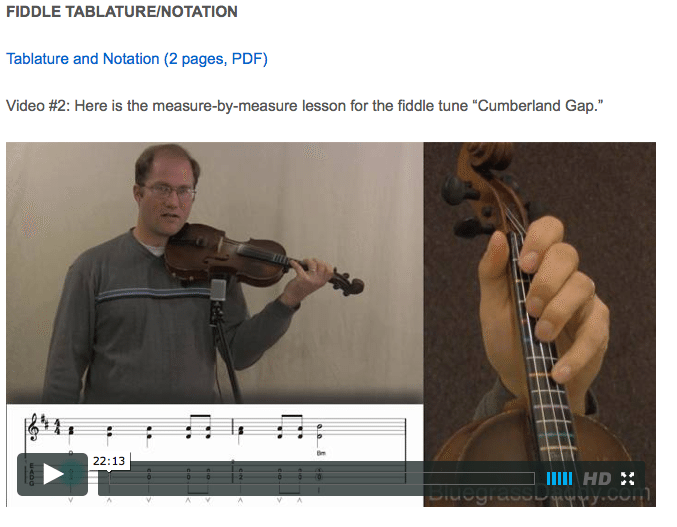 Video #1: Here is a video of me performing the beginner version based on the 2nd South Carolina String Band's "Cumberland Gap." Their lyrics are based on the less politically correct 1931 Harvey H. Fusion lyrics. Their version is also compressed, fitting two verses into one. I borrowed from both versions, and used the 1913 refrain. Cumberland Gap with its cliffs and rocks. Home of the panther, bear, and fox. Was doctor Walker, an English chap. 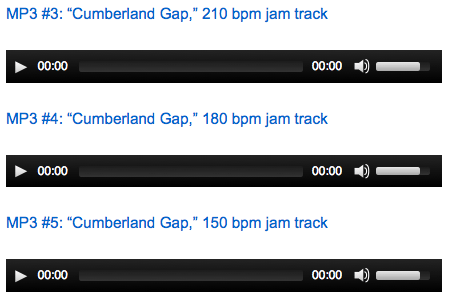 "Cumberland Gap" is an Appalachian folk song that likely dates to the latter half of the 19th century. The song is typically played on banjo or fiddle, and well-known versions of the song include instrumental versions as well as versions with lyrics. A version of the song appeared in the 1934 book, American Ballads and Folk Songs, by folk song collector John Lomax. Kephart simply wrote that the song was of "modern and local origin." The lyrics could indicate that the song references the year-long back-and-forth struggle for control of the Cumberland between Union and Confederate armies engaged in a year-long back-and-forth struggle for control of the gap. Kentucky ballad collector H. H. Fuson published a lengthy version of "Cumberland Gap" in 1931, with the first three lines in the opening stanza reading "Lay down, boys, an' take a little nap," somewhat echoing the lyrics transcribed by Kephart. Fuson's version also mentions key historical events in the Cumberland Gap's pioneer period and the battle for control of the gap during the Civil War. 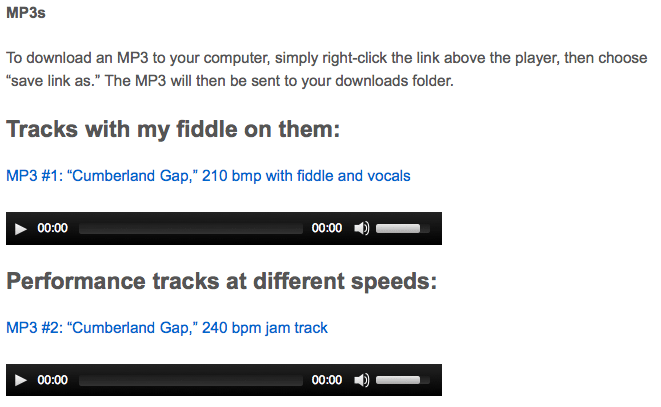 The earliest known recording of "Cumberland Gap" was a 1924 instrumental version by Tennessee fiddler Ambrose G. "Uncle Am" Stuart (1853–1926). Fiddle-and-guitar duo Gid Tanner and Riley Puckett recorded the song a few months after Stuart's recording, and would re-record the song again in 1926 with their band, the Skillet Lickers. Tanner's lyrics bear little resemblance to Fuson's, although Tanner's chorus uses the line "Me and my wife and my wife's pap," which resembles a line in one of Fuson's stanzas. In the mid-1940s, Woody Guthrie recorded a version of "Cumberland Gap" for Moe Asch's Folkways label, containing the chorus, "Cumberland Gap, Cumberland Gap/Seventeen miles to the Cumberland Gap" and a stanza referring to the gap's distance from Middlesboro, Kentucky. Folk musician and folk music scholar Pete Seegerreleased a version somewhat similar to Guthrie's in 1954. Donegan's 1957 skiffle version, which reached No. 1 on the charts in the United Kingdom, also resembled Guthrie's Folkways version, although his chorus uses "fifteen miles" rather than "seventeen miles." In May 1925, at the now-legendary Fiddlers' Convention in Mountain City, Tennessee, fiddler G. B. Grayson won first prize (although accounts vary) with his rendering of "Cumberland Gap," ousting rivals Stuart, Charlie Bowman, and Fiddlin' John Carson. Bluegrass banjoist Earl Scruggs delivered a memorable performance of "Cumberland Gap" at the Newport Folk Festival in 1959. The song has since been recorded and performed by dozens of bluegrass, country, and folk musicians, including the 2nd South Carolina String Band's rendition with Civil War-style lyrics. Earl Scruggs and the Foggy Mountain Boys performing "Cumberland Gap." Posted in Beginner, Intermediate, OldTime	Tagged with: "Cumberland Gap" "2nd South Carolina String Band" "bluegrass fiddle lessons" "old time fiddle lessons" "online fiddle lessons" "Bluegrass Daddy" "John Cockman" "John's Fiddle Lessons"